Mr Robinson had put a video of the scene on both Facebook and Instagram, in which the men could be heard cheering and shouting his name in clear support of his actions. A spokeswoman for the army, after several complaints from the public, then stated it was "investigating the circumstances," before adding "far-right ideology is completely at odds with the values and ethos of the armed forces." "The armed forces have robust measures in place to ensure those exhibiting extremist views are neither tolerated nor permitted to serve." Imam Asim Hafiz, Islamic religious adviser to the armed forces, said "any form of racism, discrimination or extremism is taken extremely seriously and will be dealt with accordingly". "The armed forces remain absolutely committed to welcoming individuals from across all faiths and cultures into its ranks." The photograph and video were taken outside a motorway service area and Mr Robinson described the group as "young recruits". Writing on Facebook, he stated: "A moment like this makes it all worthwhile. Today I met real British heroes (sic)." One of the recruits is said to face dismissal over having sung the infamous chant in support of Mr Robinson during his incarceration earlier this year. 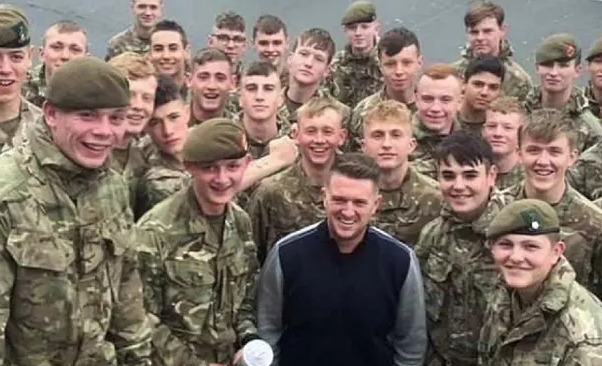 Hearing about investigation, Mr Robinson started a petition for the young lads explaining that he had met the soldiers "by chance" and they should not be "left hung out to dry" for having their photo taken with him. According to the latest count, 140,000 people signed a petition for the lads not to be discharged and for the young soldier to be reinstated. It is painfully obvious to see where the UK stands. TR wanted the world & his countrymen to know what type of sick perverts are being protected in the name of [islamic] tolerance. Yet [islam] tolerates nothing but [islam] & even persecutes itself as so called radical [islamist] will kill off less radical groups. So to you Iman Aszhat Hafiz take your line of garbage & eat it out of a nice fat hog. Police yourself & the rest of your genocidal kind. Asshim Hafwit, up yours muzztrash!! Britons will rise up against islam and run it out.